So…one of the most glaring bits of ugly in this new real estate office was the huge window with the even bigger glass blocks. 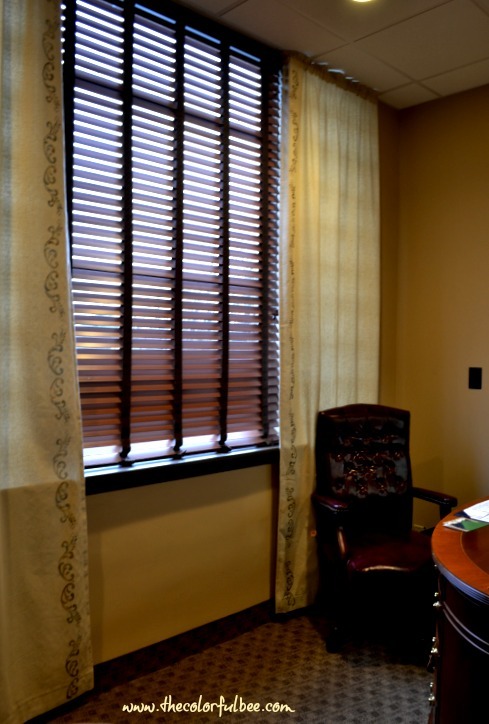 With a small budget – the best thing to do was to make some window treatments to cover them. 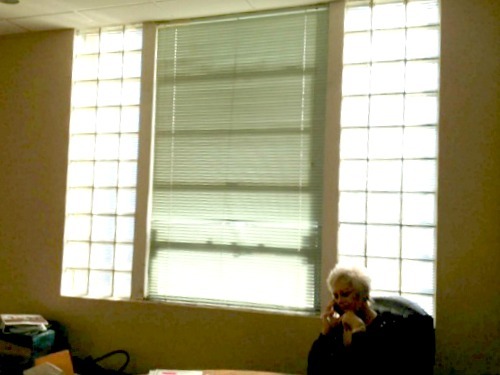 I called upon my window treatment guru, Mary Ann Schultz from the Cornice Board, to make some simple panels. I had some Osnaburg fabric (an inexpensive linen) on hand that I had bought online awhile ago for $8 a yard. While I loved the fabric and it went beautifully with the walls etc, there was really nothing special about it – so after Mary Ann finished the panels…I stencilled a border on the panels. I put a large piece of cardboard in-between the front of the draperies and the lining and I stencilled a simple design that would go with the rest of the patterns in the room. I used Fabric paint (from Faux Effects) for this – but you could use any acrylic paint plus a fabric medium to get similar effects. 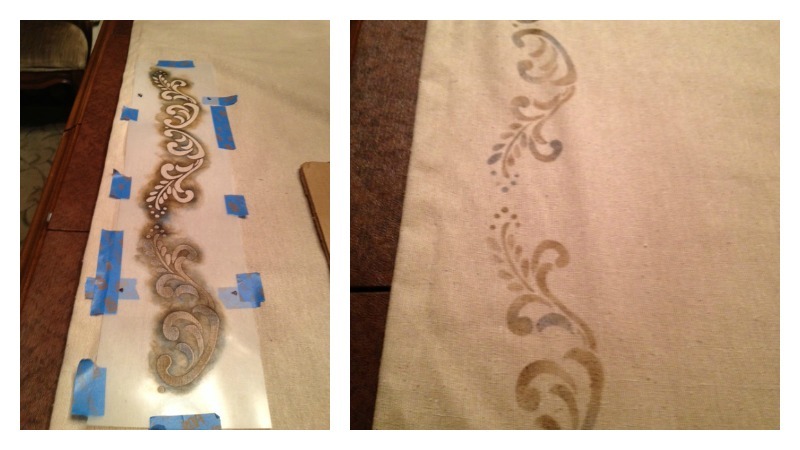 I wasn’t going for bold – just a little ornamentation to make these plain linen panels a little bit nicer. So much nicer than seeing the glass blocks!! One huge problem we encountered was that when we installed the rods we found out that part of it had to be put into an i beam – and we thought it was only concrete! So – since we couldn’t get the cement drill bit to drill through steel, we had to drill through the top part of the blinds (carefully – so that we didn’t upset the mechanism!). Let me know what you think of this transformation! This entry was posted in interior design and tagged hiding glass blocks, installing window treatments, stencilling on fabric, window treatments. Bookmark the permalink. 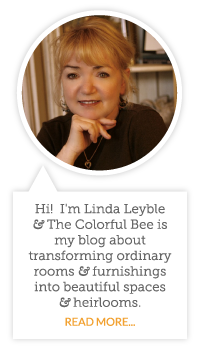 Hi Linda, I love that book shelf…it is so girly and pretty! That accent you did on the Bombay chest is beautiful, too. I would be so scared to freehand the detail like you did…very impressive! 🙂 Have a great week! Hi Amy – thanks so much for your comment. The bookshelf really needed some lightness and some contrast to bring out its beauty. And the stencil and handpainting on the chest – try doing some handpainted details on your stenciling. You will get better as you go – I did. Give it a try! 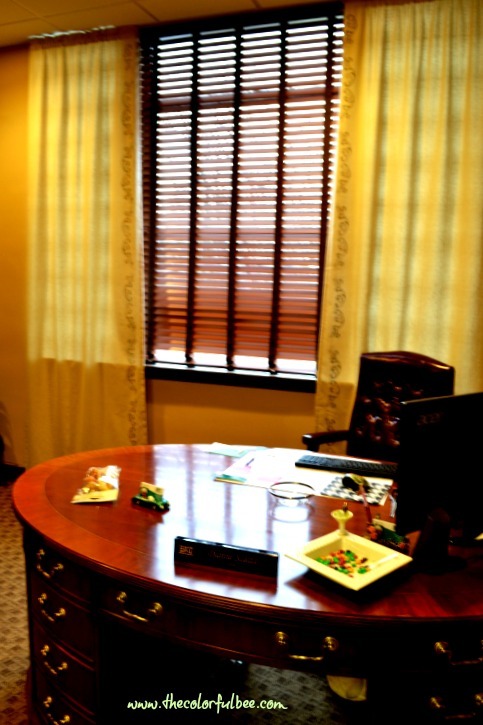 our CBD Office Rental in Singapore and I think that we can use your posts as an inspiration in re designing.